Cast: Kevin James, Jayma Mays, Keir O'Donnell, Bobby Cannavale. Story: Mall detective goes Die Hard. UK certificate PG, US certificate PG. It's fuzzy comedy time - step forward Paul Blart, Mall Cop. Kevin James is a familiar face in the US thanks to his sitcom The King of Queens, but to European audiences he'll probably only be recognised as the lovelorn dancing fat bloke in Hitch. Unless, that is, you saw him with Adam Sandler in I Now Pronounce You Chuck & Larry - but I've a strange feeling nobody saw that over here. As shopping mall security guard Paul Blart, he is a kind-hearted lardarse struggling through life getting the thick end of most wedges. Mostly potato ones. As soon as we see him making doe-eyes at mall stallholder hottie Jayma Mays (the wide-eyed barbie from Epic Movie), we know where this is going. When the mall gets taken over by Extreme Sport nutjobs who kidnap her, we know where this is going. In fact the whole plot is like the big mall map with a huge blinking light saying "you are here". With a story as carbon-copied as this one, it'd better be funny. Well, it kind of is. Most of the comedy revolves around seeing a big fat bloke falling around a lot, and I have to admit that is pretty funny, even if the best bits have already been trailered into submission. Kevin James does the likeable loser character very well, and although he teeters on the edge of nauseating soppiness, he never quite falls in. It can only be this amenable nature that has earned the movie so much success in the US, because it's really very average and yet became the highest grossing movie of the year so far. Most peculiar. Paul Blart: Mall Cop is unchallenging family fun. Without a mean bone in its body it will be too twee for some, but its warm and friendly manner will endear it to others. Try it if you can watch Disney movies without puking. To enjoy this film: big up the blubbery loser. 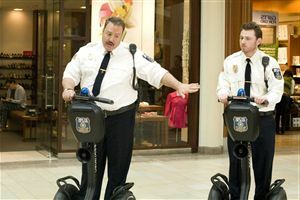 Paul Blart: Mall Cop was released in the UK on 20th March 2009.